Caroline: Most of all I think it is the variety of work and people. Being a mobile crane operator is good because almost every day I am in a different place lifting all kinds of loads and meeting lots of people. Usually my work is construction based such as timber frame houses or steel structures, but I also get a lot of really unusual jobs, too. For example, last year I spent a day at the Farnborough Air Show, helping to assemble a huge helicopter which was one of the displays. Talking to the pilots and technicians was amazing, really interesting people. Caroline: My father runs a boatyard and he’s had his own cranes there for the last 30 years. They’re used for lifting boats and cradles etc. I grew up around the boatyard and the cranes, so becoming a crane operator didn’t seem like an unusual choice to me. My parents always encouraged me to do something I enjoyed and that I found interesting, they weren’t surprised when I decided on cranes! I did my HGV license when I was 21, then Ainscough Crane Hire took me on and sent me for my training. I’ve worked for them as a crane operator ever since. That was nearly 16 years ago now. Cranesy: Tell us about safety in the workplace. 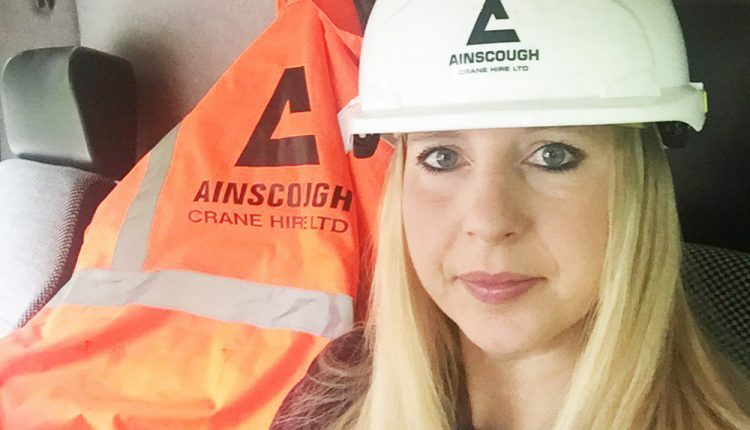 Caroline: Crane driving and operating is safety critical so throughout the day safety checks must be performed and method statemets, risks assessments and lift plans strictly adhered to. At the start of the day I perform basic checks (oil and water levels, lights, tyres, etc.) before I take the crane out on the road. Once I reach site I then check the superstructure of the crane and the lifting accessories I’ll be using for the job. Personal Protective Equipment and clothing is detailed in the method statement and must be worn at all times when on site. There are usually three pieces which must be worn, which are: hard hat, steel toecapped boots and high visibility vest or jacket. Sometimes more items will be needed depending on the working environment such as protective safety glasses/goggles, hearing protection or flame retardant clothing. There is a toolbox talk and safety briefing before the job begins, where the method statement, risk assessment, lift plan and safe systems of work are fully discussed with every member of the team. To protect yourself from potential injury, the rules must be followed at all times. Wear the protective equipment stated in the documents, do not enter areas where you are not supposed to be, follow safety procedures and safe systems of work, do not attempt to do anything which you are not trained and competent to do, be not only responsible for your own safety but also look out for the people around you. If there is anything you consider to be unsafe or wrong, report it immediately. Cranesy: Would you recommend other young women to join this career? Caroline: If it is something which genuinely interests you, then yes absolutely. There is a lot of training and hard work to go through before you can become an operator, the route into this isn’t easy and crane operating is challenging but is a very rewarding role. Cranesy: Share your special message of inspiration. Caroline: Don’t be afraid to push some social boundaries, you really can do pretty much anything you want. Do loads of research about whichever role it is that interests you. Take every bit of work experience and training that it is offered to you. Never be shy to ask for help or advice. Cranesy: How do you define happiness? Caroline: In whatever role or direction you take in life, I think being involved with people and activities that really interest you is hugely important. I don’t think I can really define happiness, I think it changes for most people as they get older, but the thing of knowing I’ve been involved in a lot of things that have made a difference makes me happy. Cranesy: What’s your favourite memory about working with cranes? Caroline: My all time favourite has to be the London 2012 Olympic Games. The opening ceremony was on Friday night, then the whole centre of the stadium had to be cleared and readied for the games which started only 72 hours later. There were about 8 cranes ranging in size plus forklifts, tele-handlers, lorries and all sorts. Also loads of people (of all trades) working together to get the job finished. It was an incredibly busy 3 days and nights work for everyone, but it was amazing! There will never be another job where I’m rigged up working next to the Olympic torch, a real once in a lifetime experience. Cranesy: How has your work in cranes inspired you in your life? Caroline: Being a crane operator opened up a whole different world of people and places that I didn’t know existed before. Unless you work in these kinds of environments, you’d never know they were here! The world is a much bigger and more interesting place than you can realise. Cranesy: Are you facing new challenges in this sector? Caroline: There are a fairly large number of challenges that mobile crane operators face. Such as access and regress on and off site, ground conditions, heavy or unusual loads, weather conditions, proximity to hazards (e.g. electricity), people working around you, the list goes on! We have to tackle at least one on every job we go on.